(All costs are per person, includes program fees, single occupancy overnight accommodations at the RRC, and meals from lunch on your first day through lunch on your final day). Come experience a daily rhythm of prayer, simple meals, communing with God in nature, communion, and spiritual direction. Like river water in a jar in which the sediment falls to the bottom, revealing the clear water, allow your spirit to settle and clear by resting in God. Each participant will also have one scheduled hour each day with a spiritual director. During self-directed reflection time, participants may walk the grounds, visit prayer stations, pray, reflect, rest, journal at their own pace. Optional Christian yoga and massage therapy are also available for an additional fee. A Spiritual Director is someone who accompanies people on a spiritual journey, helping them to grow closer to God. On this retreat participants will meet daily with a spiritual director to reflect deeply on the experiences of silent reflection. Participants should pack comfortable clothes, a journal, Bible, devotional materials, walking shoes and weather-appropriate outerwear for walking the grounds. Come for the whole time, or just a few days. Find a length of time that fits your needs and schedule. Check In is from 9 - 11am on your first day. Guests are asked to check out of their rooms by 10am on their final day, but are welcome to stay through the afternoon. 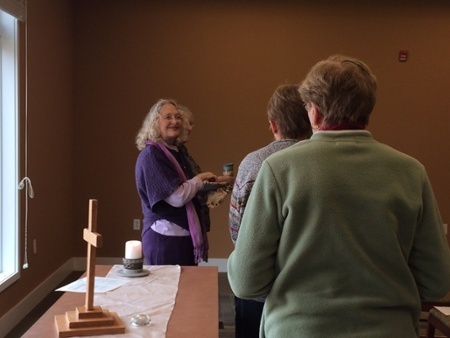 Anita Wood has been a spiritual director for 10 years, having completed the Individual Spiritual Direction program at Shalem Institute, an interdenominational program. Anita also completed the program in Ignatian spiritual guidance and retreats at the Jesuit Spiritual Center in Wernersville, PA. Anita has a small business called Gloria Dei (The Glory of God), through which she does interfaith spiritual guidance and retreats. She is also on the staff of St. Elizabeth Ann Seton Church in Bear, DE working part-time as Director of Evangelization and Mission. Anita also has a Masters in Religious Education from Boston College. She has been a Director of Religious Education in several churches and spent nearly 20 years teaching, mostly in public elementary schools. She is married, loves to travel, to read, to drink in nature and to spend time with her two year old twin grand-nieces. Rev. Karen Covey Moore has been an ordained United Methodist minister since 1985. She has served churches throughout the Peninsula-Delaware Conference of The United Methodist Church as a pastor and two years as the pediatric chaplain of the Medical Center of Delaware and three years as a bereavement counselor for Delaware Hospice. She is currently serving Chabereth Ministries, Inc. as Founder and Spiritual Director. Karen is the co-founder and a member of the Board of Directors of Hearts On Fire: Fellowship of United Methodist Spiritual Directors and Retreat Leaders (FUMSDRL). She is also the co-founder of Healing Hearts Ministries: Ministry to Survivors of Suicide. Healing Hearts offers counseling and retreats for survivors of suicide loss and workshops for those who work with survivors. Register for the Winter Silent Retreat, and the Meditation Workshop is free! Just register for any length of overnight stay at the Silent Retreat, and request the discount when you register for the workshop.